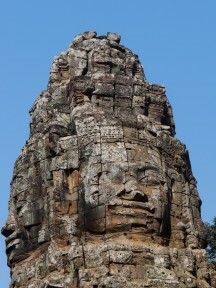 Siem Reap is a beautiful city in northwestern Cambodia, and the center of the Khmer region. From the 9th to 15th century the Khmer Empire built the temples that are now known as the ruins of Angkor – about 15 minutes north of Siem Reap. Angkor was built near the shores of lake Tonlé Sap, the region’s main source of fresh water and food, and was the largest pre-industrial city in the world with a population of 1 million at its peak. The Khmer cuisine is based on rice, pork and chicken as well as fish, shrimp, frogs, clams and snails from the lake and near by rivers. 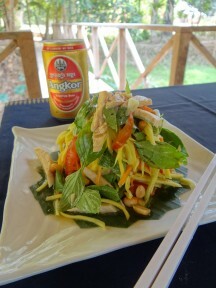 They also use coconuts, bananas, mangoes, limes, palm sugar, lemongrass, garlic, shallots and chilies in their dishes. 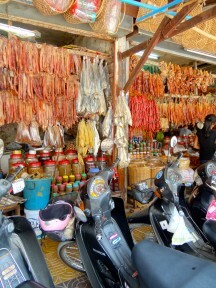 The people of the region are very friendly, and love talking about their favorite dishes and the best local recipes. 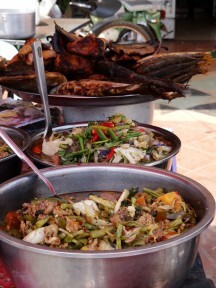 Fish Amok is a classic Khmer dish, and everyone we talked to had a family recipe. It’s usually steamed and served in a banana leaf with a little coconut cream on top. When I tested this recipe at home, cooking the curry in one pot (no steaming and no banana leaves), I found that the end result was very similar to the recipe we made in cooking class. It’s light, even with the coconut milk, and the color is beautiful. Serve the amok with white or brown rice on the side and a sprinkling of julienned red bell pepper and kaffir lime leaf ribbons. Make this curry paste with a mortar and pestle or use a food processor. The mortar and pestle will give the curry a deeper flavor. Place the first 5 ingredients in a mortar and pestle and pound to a paste. Alternatively, place first 5 ingredients in a food processor and process until a smooth paste forms. Add the remaining ingredients and pound or process until all spices are well incorporated. Thinly slice the fish into ½-inch thick bite size pieces and set aside. Heat the oil in a saucepan over medium-high heat. Add the curry paste and cook for 1 minute. Add the shrimp paste, coconut milk, sugar and salt, whisking to combine. Turn the heat to medium and simmer for 2 minutes, whisking occasionally. Add the fish and spinach leaves, gently folding the fish into the curry sauce with a wooden spoon or rubber spatula. Let the amok simmer for 3 to 4 minutes, or until the fish is just cooked through. Turn the heat off. In a small bowl, whisk the egg with the fish sauce and 2 tablespoons of the curry sauce from the pan. Pour the egg mixture into the saucepan and gently fold it into the curry. Serve the amok in a bowl with a spoonful of coconut cream (the thick cream that rises to the top of the remaining coconut milk), a few julienned red pepper pieces and a sprinkling of kaffir lime leaf ribbons.